Well, wouldn’t your interest have been whetted? So I replied and for some reason, agreed to do it. Three metres didn’t sound very big, but when I received the template, I realised I was in trouble—3 metres is actually 10 feet! As an American who works in inches and feet, I hadn’t fully twigged this, although I should have. But the part that I hadn’t appreciated was that I had to create patchwork for the interior and exterior of the “O”. The width was 153cm/60” and the length was 6 metres for the inside, and 16 metres for the outside. That’s an awful lot of patchwork. I suddenly felt doomed. The only answer was to call for help and my cry was answered by another Guild member, Lynne, who cheerfully said she had a free couple of days and would be happy to help. Whew! So I badgered the Wool Board to get the fabric to me fast as I was leaving for a trip in ten days—not too much pressure! The fabrics were supplied in various patterns/colours by the textile trade producing cloth for suit manufacturers on Savile Row. A box of mainly blues and browns arrived; thankfully there were also pieces of white and cream wool for contrast. In addition, I received six rolls of thick wool felt from an upholstery cloth manufacturer. 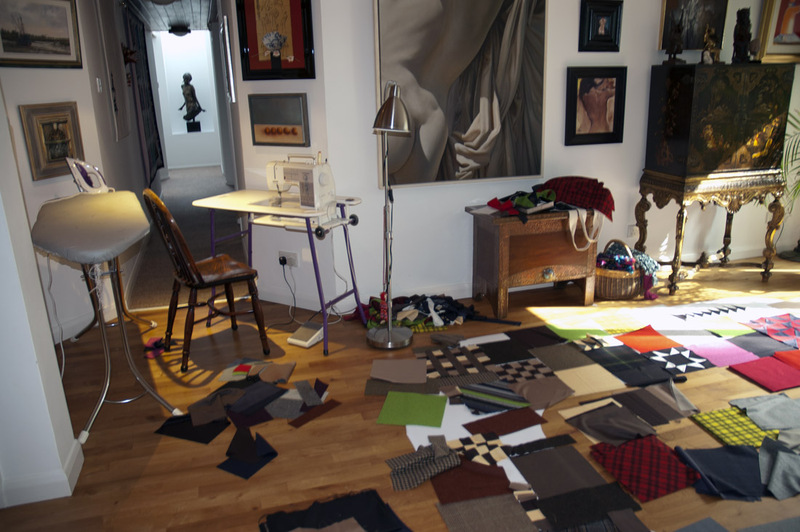 The intention was to represent the diversity of wool in patchwork. 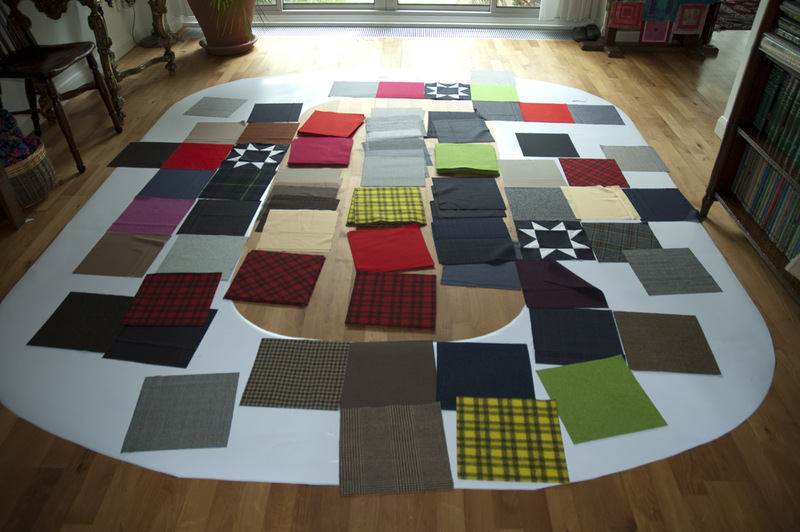 However, the Wool Board didn’t quite understand the concept of patchwork, which is to work with fabrics of a similar weight. In reality, the fabrics ranged from thick upholstery felt to thin suiting (that shredded terribly). A real challenge! However, I immediately envisaged what I wanted to do and got to work cutting out squares. I used some quick patchwork techniques to create chequerboards, half-square triangles, pinwheels and flying geese, some of which I made into stars. At the end of the day, I couldn’t understand why my rotary cutter wouldn’t close fully, but discovered it was filled with wool fluff. That fluff got into every crack and crevice of my house before I was finished! On Monday, I laid out the template in my dining room and arranged the squares on top, interspersed with the chequerboards, stars, pinwheels and flying geese. This task took almost all day, but I managed to sew one quarter of it together before dinner. I must stress here that my entire house was now brimming over with wool in all shapes and sizes—the kitchen contained my cutting mat and piles of squares, the dining room was untouchable because of the template and all the loose pieces on top of it, and all the dining room furniture had been dragged into the living room. My poor husband felt quite displaced, but took it all with good humour, even as we ate our dinner beside stacks of wool that night. I decided the inside of the O would be a straightforward patchwork of squares—with a few stars thrown in. 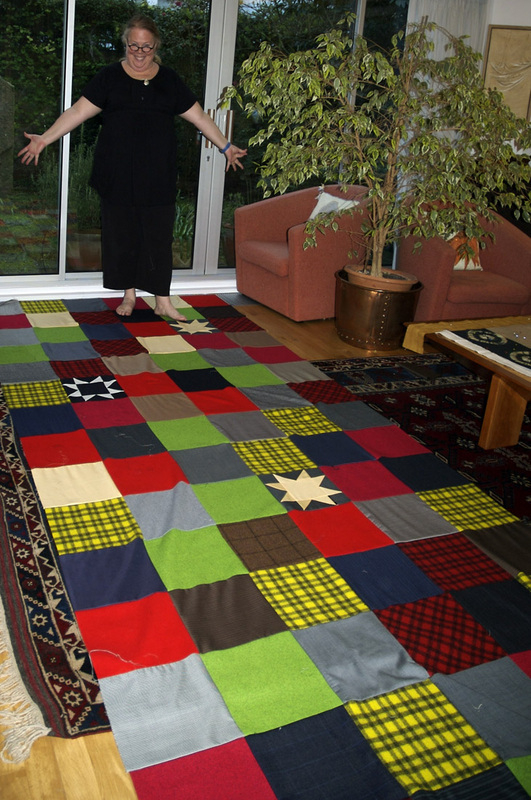 When Lynne arrived on Tuesday with her sewing machine, I gave her the task of sewing the 6 metres of patchwork squares while I got on with the more intricate piecing for the front. We blasted rock & roll music and began sewing, and although we worked very hard, it was actually lots of fun. However, we quickly realised that it was going to take a very long time to piece the 16 metres for the outside of the “O” if we did it in squares. I called the designers and we decided that the outside could be pieced in long strips and sewn together to resemble planks in a floor. That was an excellent solution. Lynne finished the inside strip and went home for a well-earned rest! The next day I cut the strips for the “planks” and Lynne began sewing them together. 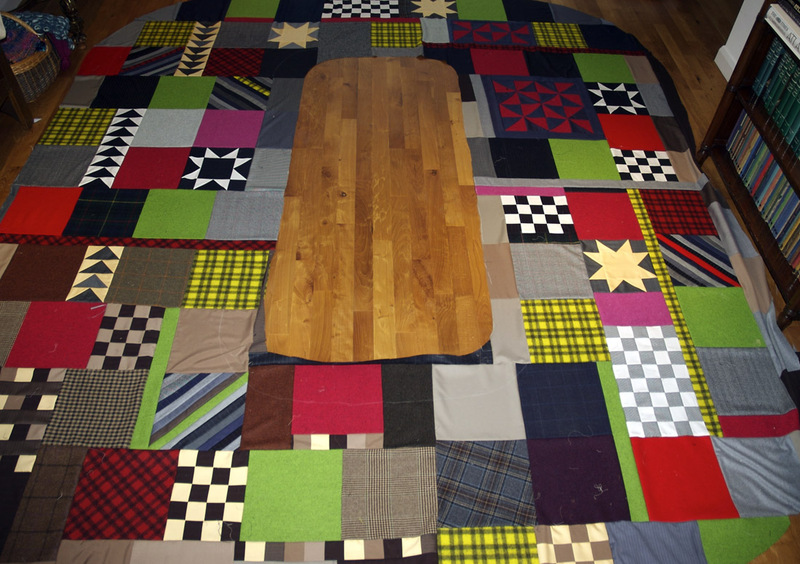 It’s 16 metres from one end of my house to the other so we had a template—my floor! One of the things we hadn’t understood was how heavy the finished pieces were going to be. I constructed the front of the “O” in quarters, but when I finally sewed them together, it was a mammoth task. Ditto the outside strip. By Wednesday evening, we had sewn everything together and were exhausted. I spent all day Thursday cleaning up threads and pressing the pieces, using the kitchen table to support the work. It was a backbreaking job, but someone had to do it! As I worked, I rolled the strips for the inside and outside of the “O” onto tubes. I had to fold the front of the “O” and carefully roll that onto a tube as well. I can’t express the relief I felt when the courier came to collect the packages on Friday. Lynne and I were invited to the launch of the campaign at Grand Designs at the Excel Centre in London in May. We were anxious to see what it would look like and were thrilled with the result. 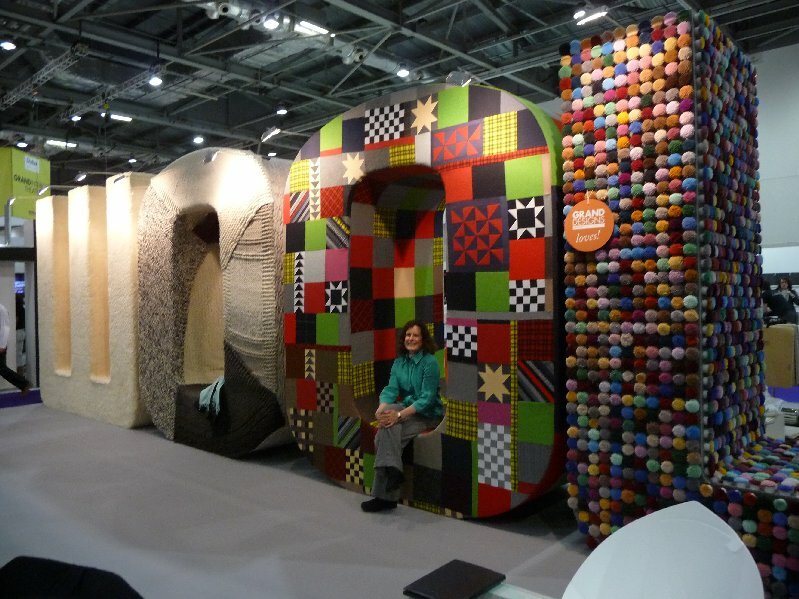 The designers had hired an upholsterer to secure the pieces to the wooden frame of the “O” which had been padded with foam. 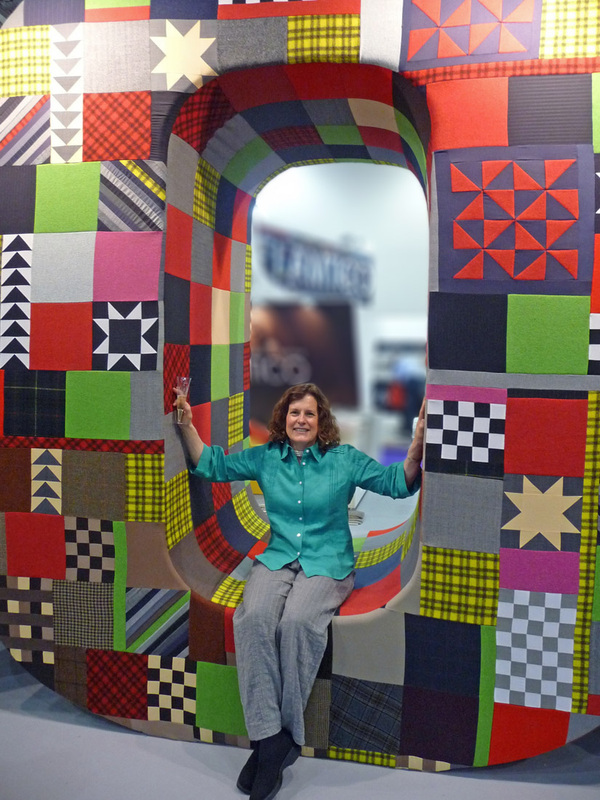 It’s very comfortable to sit in/on, and the exhibit won a special award at Grand Designs. I hope many of you will see it as it travels around various shows over the next few years.